The Karl Heusner Memorial Hospital (KHMH), Belize’s premier public medical facility, is once again walking on hot coals following the confirmed discovery of an abandoned, decomposing fetus inside the hospital, in fact, under a hospital bed in the Observation Ward – an incredible, horrible incident that has the hospital’s authorities fleeing for cover. The discovery was made last Friday night, and police, in a press release dated today, Monday, June 2, said that, “Based on information received of an abandoned fetus at the KHMH, at 8:45 p.m. on Friday, May 30, police visited the KHMH and spoke with the Assistant Unit Manager, who informed them that sometime around 8:00 p.m. that Friday, a female patient alerted nurses of a [stench] coming from under the bed that she was lying on in the observation room of the hospital. “Upon making checks, hospital authorities discovered what appeared to be residues of human tissue, believed to be a fetus, in a small white box under the patient’s bed, in an apparent state of decomposition. KHMH officials have refused to release any information to the media, other than to say that it is a police matter. It is unclear, therefore, whether there will be an internal investigation initiated by the KHMH to establish how and when the fetus came to be left under the bed – apparently for days – and by whom, or if the investigation is to be carried out totally by police. Police, for their part, have said that their investigations into the matter are ongoing, but it is not clear what information they have at this time, apart from what was divulged in today’s police release. The authorities have yet to explain how a pregnant woman could have been admitted to the Observation Ward and leave without any of the professional medical staff noticing that her pregnancy had been terminated. Was it not the duty of the hospital’s staff to have taken care of the mother and the fetus after it had been expelled? Who cleaned the woman and the bed after the ordeal? Some have also questioned whether surveillance camera footage is available to provide leads in the case. In the wake of the tragic deaths, the Pan American Health Organization (PAHO) went in to conduct an assessment and compiled a report with recommendations for the safety and effective functioning of the Neonatal Unit. That report showed that there were a number of irregularities at the KHMH which could have contributed to the deaths of the 13 neonatal patients, including the fact that the hospital had not met international standards in trying to insulate its patients from contamination at the time. 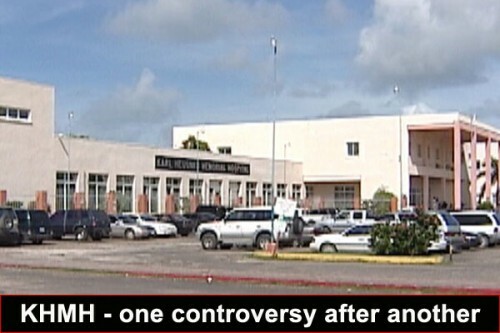 The damning report also pointed out that the hospital has an Infection Control Committee (ICC) which advises the hospital on its Infection Prevention and Control program; however, the PAHO investigators found that if the program had been functioning as well as it should, the bacterial outbreak which caused the death of the neonates would not have been so catastrophic. But the case of neonatal deaths, for which no one has yet been held accountable, will now be determined by the court, because five of the mothers who lost their babies have filed wrongful death lawsuits against the KHMH.